Tune in to a range of conversations that were part of the Evolving Conversations Forum, Living Data’s contribution to the Ultimo Science Festival – hear the comments and be part of an evolving discussion about ways science and art may interact to bring information in new ways. Enjoy more forum excerpts here. The Evolving Conversations exhibition space offers the opportunity to write comments in response to the works or draw on the ‘blackboard’ walls. 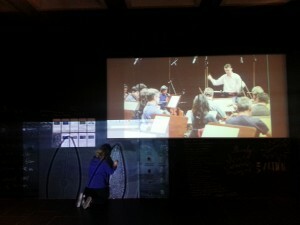 Here phytoplankton emerge on the walls as a young artist listens to the tinkling sounds of excerpts from the symphony ex Oceano by Matthew Dewey; the second movements offers a sonic interpretation of the plankton world. Learn more about the symphony at ex Oceano.